Andrew Fisher was Prime Minister of Australia three times—1908–09, 1910–13 and 1914–15. His second government controlled both Houses of Parliament and it was, until the 1940s, Australia’s most reformist administration. In these three years, 113 Acts were placed on the statute books, thus changing the future pattern of the Commonwealth. 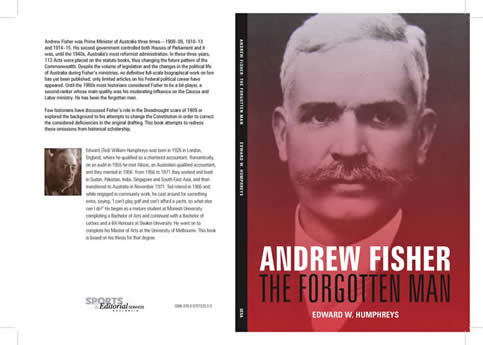 Despite the volume of legislation and the changes in the political life of Australia during Fisher’s ministries, no definitive full-scale biographical work on him has yet been published; only limited articles on his Federal political career have appeared. Until the 1960s most historians considered Fisher to be a bit-player, a second-ranker whose main quality was his moderating influence on the Caucus and Labor ministry. He has been the forgotten man. Few historians have discussed Fisher’s role in the Dreadnought scare of 1909 or explored the background to his attempts to change the Constitution in order to correct the considered deficiencies in the original drafting. This book attempts to redress these omissions from historical scholarship. Edward (Ted) William Humphreys was born in 1926 in London, England, where he qualified as a chartered accountant. Romantically, on an audit in 1955 he met Alison, an Australian-qualified accountant, and they married in 1956. From 1956 to 1971 they worked and lived in Sudan, Pakistan, India, Singapore and South-East Asia, and then transferred to Australia in November 1971. Ted retired in 1986 and, while engaged in community work, he cast around for something extra, saying, ‘I can’t play golf and can’t afford a yacht, so what else can I do?’ He began as a mature student at Monash University completing a Bachelor of Arts and continued with a Bachelor of Letters and a BA Honours at Deakin University. He went on to complete his Master of Arts at the University of Melbourne. This book is based on his thesis for that degree. Edward W. Humphreys, Andrew Fisher: The Forgotten Man, Sports and Editorial Services Australia, Teesdale, Victoria, 2007.